If you recall from some of our earlier data stories, we’ve looked into several different loan products and reasons for their increase and/or decrease in use over the last few years. The overarching theme we’ve been discovering is that loans are, not surprisingly, driven by the interest rates that come with them. However, we wanted to look at some of the larger jumbo loans to see if they too follow with this trend. Looking at the data compiled internally from within Marksman, jumbo loans fall in line with the same trends as other, smaller loan products. Over the last four years, jumbo loan purchase prices have spiked at times when rates were at their lowest across the country, peaking at 1.2 million at the end of 2012, and again at about a million at the beginning of this year. Conversely, when rates hit their high points, the average purchase price dropped significantly, hitting low points at the end of 2011, and beginning of 2014. 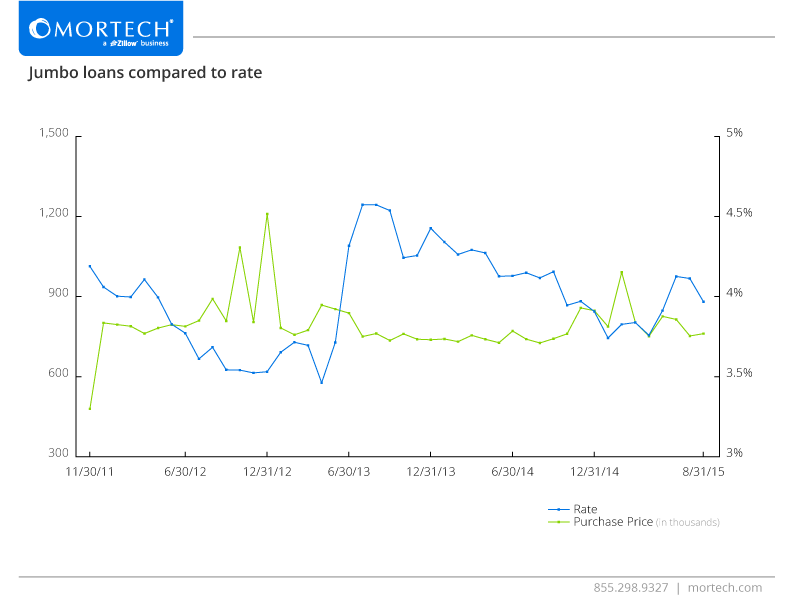 As rates continue to fluctuate, jumbo loans, as well as other products, will see their usage fluctuate as well. With so many products and borrowers depending on rates, it’s important to deliver the most accurate rates as fast as possible, to ensure that you’re always offering the most borrowers the best rates. Luckily Marksman can help push your rates online to thousands of borrowers, and provide you with tools to quickly contact and work with them to close more loans, all while keeping them happy. Find out how you can use Marksman to push your rates to more borrowers today.